Graham (Gray) R. Gold has been playing the guitar since 1968. 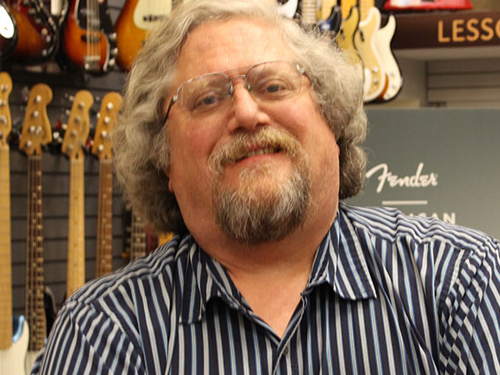 He has been teaching guitar, bass guitar and mandolin at Music Land in Bel Air since 1989. Mr. Gold teaches a wide range of music including blues, jazz, rock, classical and country. He himself has performed (and still does) with many blues and jazz groups including his own. His students range in age from 8 to 80. Some play the guitar as a hobby while others have plans of studying the guitar or bass guitar at the college level. Many of his students have received awards and recognition on their own and many play in local bands. Mr. Gold has been the band director at Hamilton Elem./Mid. School #236 since 1998. At Hamilton he directs the Junior Band (beginning), the Senior Band (advanced), the String Ensemble and the Guitar Ensemble. His bands/ensembles have received numerous awards at competitive festivals in and out of state, and went to the Maryland State Band Festival in 2009 and 2014. In addition to his instrumental teaching responsibilities he also teaches general/vocal music to the 1st through 3rd grades. Mr. Gold graduated from Morgan State University in 1994 in the top 5% of his class, with a B.S. in Instrumental Music Education, majoring on guitar with a minor on saxophone. He has obtained a master equivalency through graduate course work at Morgan, Villanova University and Duquesne University. He is also a 1984 graduate of the Musicians Institute (Guitar Institute of Technology) in Los Angeles, Ca. with a focus on guitar. He has also taken master classes with Joe Pass, Jim Hall and other noted guitarists. Mr. Gold is a frequent attendee at the Annual North Carolina Conductors Conference which is held annually at the University of North Carolina Greensboro and was the conductor of the 2008 BCPSS Middle School Honors Band and the 2012 and 2014 BCPSS Middle School Honors String Orchestra. Mr. Gold was the recipient of the 2011 Baltimore City Public School System “Excellence in Music Education Award”. He currently holds a Maryland State Advanced Professional Teaching Certificate. He also has studied with noted band music composers Dr. Quincy Hilliard and Jerry Nowak. Mr. Gold spent several years performing in various music groups/bands and as a studio musician on both the east coast and west coast, including Baltimore, Los Angeles and Las Vegas. He currently performs locally with his band “Strong Persuader”. He also released a solo jazz fusion album that received local air play in 1994. He is married and has two daughters who are also involved with music, his oldest graduated from Shenandoah Conservatory with a Masters in Clarinet Performance and the other is a graduate of the Baltimore School for the Arts on flute. He enjoys travel, American history, and is an avid motorcyclist and President of the Baltimore Riders Association of Triumph. He firmly believes in and is committed to children receiving a solid education in music and that music is essential to the growth of all individuals and society as a whole.